The results of the Vocus 2011 PR Planning Survey are out and the number of organizations that plan to focus more on SEO and social media has declined. While these are small changes I find the trend discouraging. The PR industry has made good strides in its understanding of SEO in recent years but more often than not implementation beyond basic best practices falls short. So if anything more attention needs to be paid to SEO. There may also be a tendency for some PR pros to think that social media has reduced the need for SEO, as evidenced by the “SEO is Dead” memes that resurface from time to time. The reality is quite the opposite; social media marketing and SEO are completely intertwined and each strengthens the other. Speaking of social media, last year it dominated the mix with 80% of the respondents stating they would increase their focus on it. In the 2011 survey that figure drops to 69%, which is still very high considering how much attention is already being paid to social media in the PR world. Let’s hope the SEO trend shifts back up in 2012. Nice analysis Adam, thanks for sharing your thoughts. For what it worth, my sense in reviewing the data that the slight dip was really indicative that social media isn’t new anymore — it’s a prerequisite. One point you make that really stands out for me is, “The reality is quite the opposite; social media marketing and SEO are completely intertwined and each strengthens the other.” This is so true, and with social search it’s becoming increasingly important. Great point! Thanks Frank. I think you’ve got it right regarding the social media dip; those practices are now a core component of PR programs and no longer seen as an add-on or separate initiative. And even with that, 69% wanting to do more with social is still a very big number. 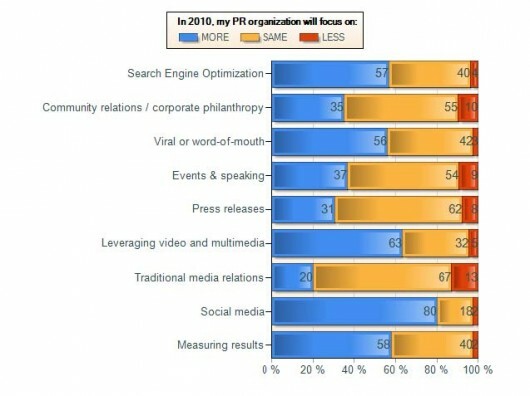 The big picture that I really saw in these results is that three core areas are starting to come to the surface of what public relations will focus on and what value it will offer, not only in 2011, but for several years to come: measurement standards, social media and strategic communications. You look at all three of those areas, and I think it’s fairly safe to say that those are the three concerns of not only PR professionals, but more importantly, of the broader business community. Strategic communications, as we continue to see in the new “WikiLeaks age” is absolutely vital, and that corresponds nicely to a core focus on social media. As Frank noted, social media is largely moving beyond being the new, novel thing in PR agencies and corporate communications departments, and is now becoming part of our everyday focus. Which, thankfully, means far more focus on developing strategy around the utilization of social media, which is always a good thing. And seeing a strong focus in 2011 on measurement results is great to see, as it means that the profession, as a whole, has placed this vital area of our business as a priority. It’s something we continue to hear from the business community (e.g. that global standards for PR measurement are needed), as is something that the Barcelona Principles and recent conferences have placed a keen focus on. 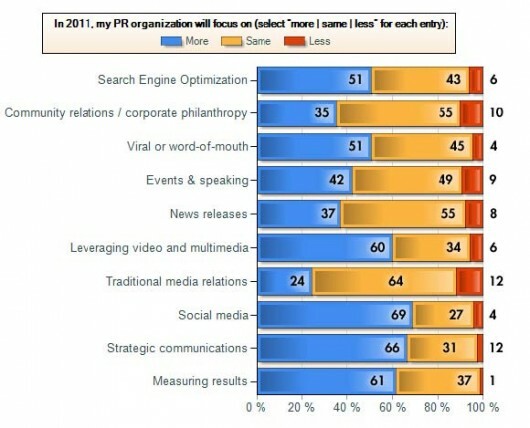 Based off the results of the Vocus PR Planning Survey, I’d say 2011 will be a strong year for public relations. Well said Keith. I appreciate the comment.